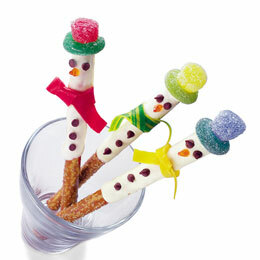 Dressed in colorful candy scarves and top hats, these stylish, easy-to-make snowmen are sure to liven up any holiday gathering. Melt 1 cup of white chocolate chips. We done this in the microwave, but can also be done on the top of a broiler. Take each pretzel rod and dip one end in the melted chocolate. Spread the chocolate two-thirds of the way down the rod. Set the pretzels on a sheet of waxed paper. Press on mini chocolate chips for eyes and buttons. Set the pretzels on a sheet of waxed paper and press on mini chocolate chips for eyes and buttons. Use orange decorators’ gel or frosting to add a carrot nose. After the chocolate has hardened, stand the pretzels up in a glass and tie on your strips of fruit leather to make colorful scarves. For each hat, stretch a gummy ring over the narrow end of a gumdrop and secure it on the pretzel rod with a dab of melted chocolate. Stay tuned for more fun holiday treat ideas you can enjoy with your kiddos while they are on Christmas break! « Get Beauty Editor & Treatment for $0.01! This is such a good idea-quick, easy, fun treats.